I’ve never quite understood why the decorative arts are overlooked, but unfortunately they are the forgotten stepchild of all art collections. Throughout the entirety of my four years of art history classes, the decorative arts came up only once and took the form of a humungous book that we were forced to purchase against our will, filled to the brim with photos of tables, chairs, chests, ottomans, buffets, dining sets, and headboards. At the end of the semester I re-gifted this behemoth to my mom for Mother’s Day and now it gathers dust on her coffee table. I fear that’s more exposure to the decorative arts than most people ever get. As I crossed the threshold from busy, loud, smoggy Los Angeles into my personal Mecca, sanctuary, and glorious escape—aka The Huntington, I asked my good sport of a boyfriend why he thought the decorative arts didn’t get the recognition he or I thought they deserved. We agreed that maybe they are placed on the artistic back-burner because they are born, first and foremost, out of necessity, but I have always held the decorative arts in the highest esteem. Maybe I do because I believe that art is not only hung on a wall but rather all around us, from the way we garnish our homes to the very things on which we rest our tired feet. Furniture, just as much as painting or sculpture, represents and defines the visual culture of the times, and provides a platform for individual expression and audacious risk-taking. This holds true more than ever in the Huntington’s current exhibition, The Artistic Furniture of Charles Rohlfs, the first-ever display of Rohlfs’ exhilarating and unmistakably avant-garde late 19th / early 20th Century furniture. Charles Rohlfs (1853-1936) is frequently classified with the other greats of the Arts & Crafts movement (think William Morris and the writings of John Ruskin), but while he was undoubtedly a leader in America’s first entrée into modernist design, his vision and execution resisted a generalized and conformed grouping. His lack of formal training enabled him to create unconventional and mind boggling shapes. Even though his work advocated truth to material and traditional craftsmanship inspired by the medieval, romantic and folk styles of decoration, his furniture reveals overwhelming individuality and character. His are the type of fixtures you’d swear were conceived over a late night of pipe tobacco, opium, and absinthe—and I mean in all the right ways. The furniture of Rohlfs on display at the Huntington is impressively delicate and noticeably romantic. The most modernist piece, in my opinion, is his Desk Chair (c.1898-99). Subtleties like the parabola shaped seat, intricate cross bracing and complicated trapezoidal legs distinguish this chair as one of the exhibition’s highlights. It screams turn of the century, but just like all of his furniture, it takes the inspiration to a whole new level. The pieces looked awesomely futuristic and at times almost alien, even by today’s standard. In 1899, the experience must have been fantastical laced with a slight touch of terrifying. 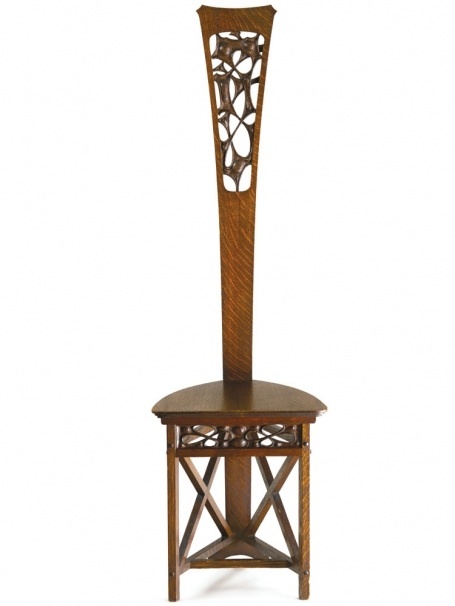 Similarly, his Hall Chair (c.1904) served as another focal point to this unprecedented exhibition, but took on a less contemporary aura and resonated something very to similar to Deco architecture. I couldn’t help but compare the symmetrical, geometric, and cubist attributes of Hall Chair to the details of deco masterpieces such as the Chrysler Building (1928) or even the terracotta sunburst I’ve noticed in the Eastern Columbia Building (1930) right here at home. Clearly, Rohlfs was ahead of his time. Upon seeing his work, one might think that Charles Rohlfs was a celebrated genius among his contemporaries, but beyond the surface lay a man whose career and ambitions were in a constant state of struggle. The exhibition does a beautiful job showcasing not only the product of an inventive mastermind but also poignantly tells the story of Rohlfs’ complicated and distressing legacy. He was in a perpetual state of debt, scrounging for enough buyers to support his growing profession, all the while thinking of bigger and better marketing strategies to keep his dream afloat. In 1907, amidst one of America’s most severe economic panics, he developed a plan to market his furniture to a larger audience by issuing cards with descriptions, illustrations, and prices of his work—all on display in the second half of the exhibition. Despite his efforts, he still relied heavily on commissioned interiors and therefore had to design with the client in mind first, his own motivations second. Photos and pieces from his large scale commissions make up the final parts of the exhibit. The compromise between artist and patron is evident from the noticeable discrepancy between the furniture born out of inspiration and that born out of necessity. The commissioned interiors show fixtures that are far weightier, solid and sturdy and that are clearly different from the delicate and elaborate details of his earlier work. Even though this look is more popularized, it remains distinctly Rohlfs. Rohlfs remained productive and active throughout his life, far after the 19th Century’s House Beautiful movement first inspired Rohlfs to pour his ingenuity into the decorative arts. The final object on display is the last piece he ever created. “Lamp Made for Sterling Rohlfs” is a tribute to Charles’ son who tragically died in a 1928 plane crash. The piece, while intricate and expertly devised, speaks to Rohlfs’ unwavering dedication to his art and his family. If ever there was a reason to brave the 110 freeway, The Artistic Furniture of Charles Rohlfs is it. Exhibitions like this don’t come around often, especially those on the decorative arts. I assure you, this exhibition will change the way you think of furniture, and make you utterly abhor your boring desk chair at the office. The Artistic Furniture of Charles Rohlfs is on display at The Huntington Library, Art Collections, and Botanical Gardens through September 6th. Visit www.huntington.org for more information.